The hallmark of a religion’s influence in society is the good works of church volunteers. Ladies auxiliary groups have tended to the sick, held the bake sales that help fund the new hymnals, conducted Sunday School or a host of many other duties, all above and beyond their church worship. 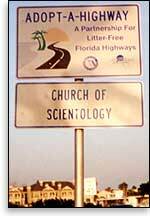 The Church of Scientology is no different. What began in 1996 as a small, but dedicated group known simply as the Clearwater Community Volunteers (CCV) has become the umbrella organization for 15 area volunteer teams that have grown to more than 400 active members and 2,000 volunteers. These groups include the Church-chartered Boy Scout troop and Cub Scout Pack, three Girl Scouts units, the Cherish the Children Foundation, Artists in Action and many others. Most recognized in Clearwater this time of year for their annual Winter Wonderland food and toy drive, this group also produces the Annual Easter Egg Hunt in Coachman Park for more than 2,000 children, helps promote and spreads the “Just Say ‘No’ to Drugs” message throughout the Tampa Bay area — non-stop and full speed. This year, something new was added as well, with a fundraising fashion show held in conjunction with the Boys and Girls Club of Clearwater. Hosted by the Bellaire Country Club, $20,000 was raised and then split between the Boys and Girls Club and Winter Wonderland. The self-funded CCV contributed 170,000 volunteer hours last year on a variety of programs that not only touched families throughout Tampa Bay, but also reached statewide and beyond. Active in CCV for many years, Sigal, Ryan, Debbie Sharp, Craig Burton and a host of others form the nucleus of the volunteer group. Their dedication was recognized earlier this year in a proclamation issued by the Mayor of Clearwater on behalf of the city. Acknowledged were all CCV members as “a vital and positive force in our community”. Because the group “is making a significant contribution to bettering the social, community and cultural conditions of the City of Clearwater,” the proclamation states, March 20, 2003 was declared “Clearwater Volunteers Day” by the City of Clearwater.